We started with Cosmic Run: Renegeration, which I've been hearing about quite a bit lately. 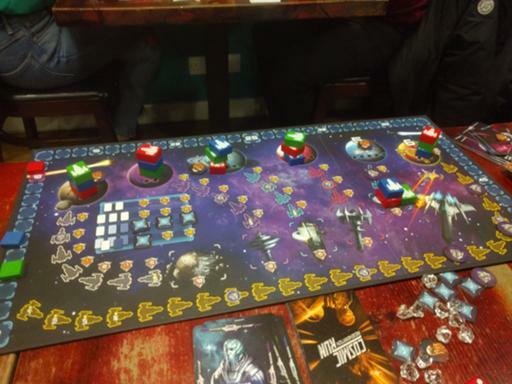 It was very reminiscent of Alien Frontiers: each turn you roll a bunch of dice, and depending on their values place them in different spots. 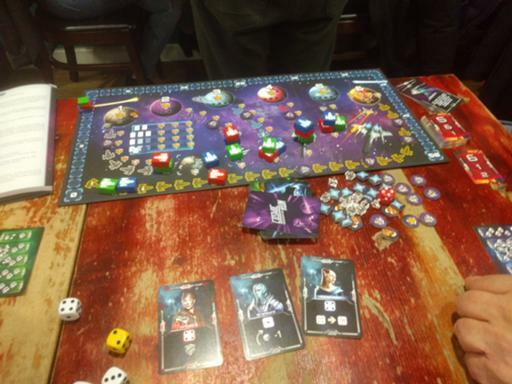 You don't have the blocking of Alien Frontiers, though: you place matching sets on the various "planet" tracks to score points (the theme is tissue-thin), specific dice on "alien" cards to buy them into your hand and get one-shot bonuses later (which is pretty much the only bit of player interaction, as you can buy a card someone else might want), and anything left over goes to "crystals" that let you buy die-manipulation powers. 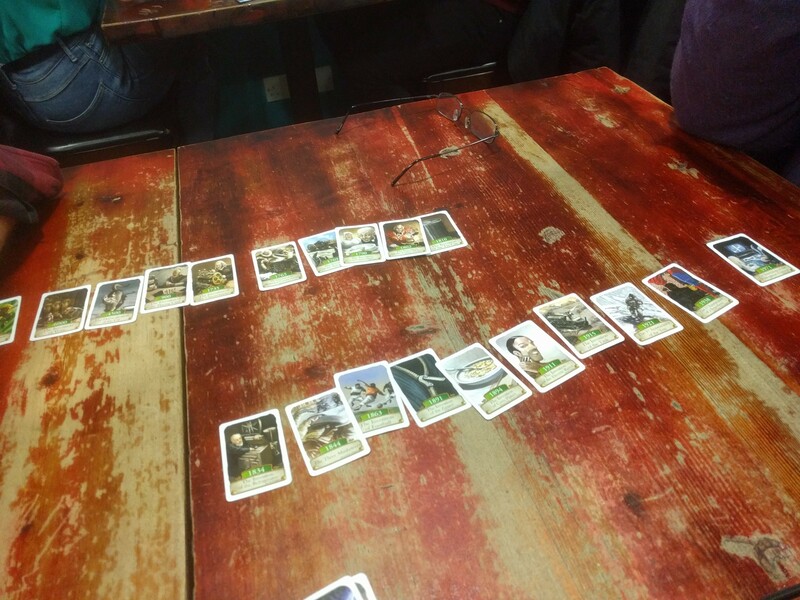 Meanwhile, planets are being hit by meteors based on a card draw, and when they're all out of play the game is over. I won, thanks to a high-risk strategy (building up a set of five different alien cards to discard all at once, which I managed one turn before the end of the game). But mostly I felt I was being reminded that it's too long since I played Alien Frontiers, which has very slightly more of a theme, and more combinations of dice to look for than "N of a kind". 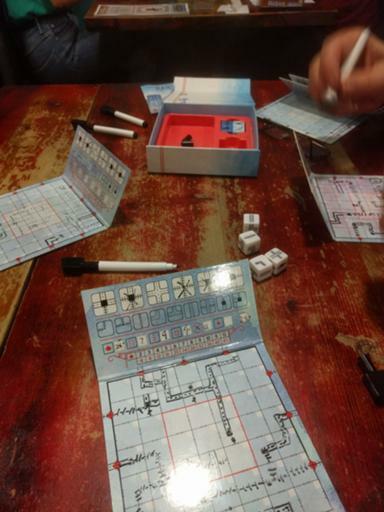 The next game was Railroad Ink, not helped at all by the few remaining pens in the box being very dry. I did terribly. 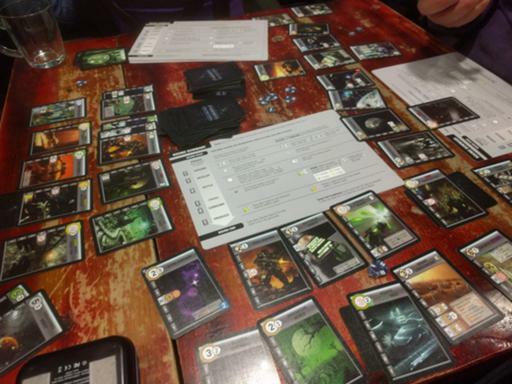 It seemed to be quite a non-interactive evening; we went on with Race for the Galaxy which I haven't played for too long (and may well buy if/when it gets cheaper again). A close game, though I still lost. [Buy Railroad Ink at Amazon] [Buy Race for the Galaxy at Amazon] [Buy Timeline General Interest at Amazon] and help support the blog.